Tempilaq is a temp-sensitive “paint-on” liquid coating which can be used to gauge case temperatures during the annealing process. Tempilaq is offered in 43 different temperature ratings from 175°F to 1900°F (79°C to 1038°C). Tempilaq quickly dries, forming a dull, opaque film. Then, when heat is applied to that surface and the rated temperature is reached, the film liquefies, letting you know that you’ve reached the target annealing temp. Because you can ruin brass by over-annealing, we recommend using Tempilaq when annealing, at least when you are setting up your torch position and calculating the amount of time your cases should be exposed to the flame. To prevent premature “burn-off” you can apply the Tempilaq to the inside of the necks. One of our Forum members from Australia was concerned about some 700° F Tempilaq he had recently obtained. He explained that it was thick and glue-like, making it hard to apply. He wondered if there was a thinner he could use with the 700° Tempilaq. 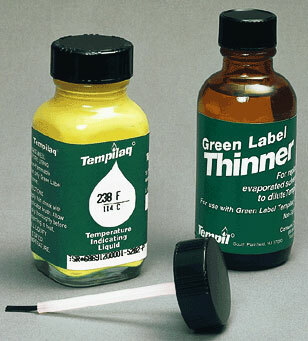 Share the post "Tempilaq and Green Label Thinner"
Don’t live in California and order thiner from McMaster Carr. They won’t ship it to some areas because of AQMB regulations.